I spilled my first can of paint on Monday night between Blackboard outages. I was at home with Ella, who was finally napping, and so I decided to put a quick coat of paint on the last window we installed. It was quick, but the server had to go down during finals. I set the can on the window’s ledge to go answer the phone and get the server going, then came back and bumped the can. It fell. Turned over completely and managed to land opening down. Luckily. There was spill and splatter from the fall, but I was able to flip the can back over with the newspaper holding 90% of the paint in the can. I was mortified. I’ve gotten so cocky about painting that I hadn’t even changed clothes. 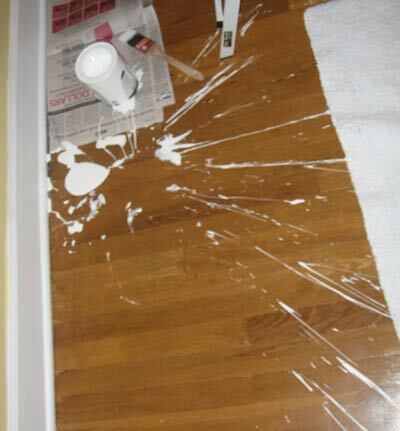 Normally I don’t even bother to put down any drop cloth, but did this time because the paint had been acting finicky. Finally, a good reason to use latex enamel.